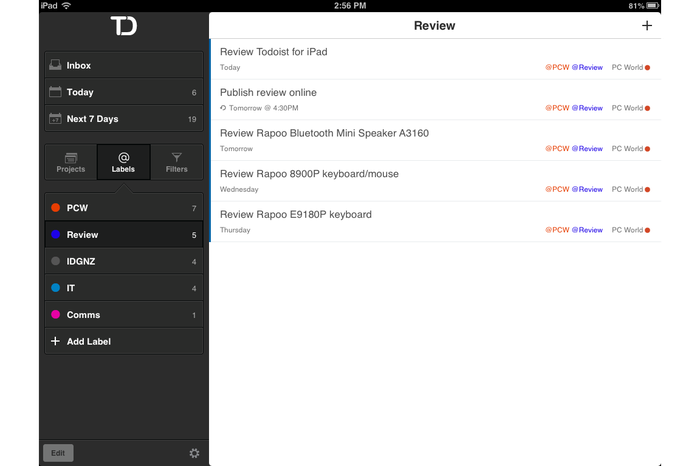 Todoist is a top-quality online to-do list service, and the latest version of its iOS app adds much-needed support for iPad tablets. Todoist is an exceptional service, and well worth the annual subscription fee for a premium account. There are a few things clearly missing from the iOS app, though, which should make you think twice if that’s your primary computing platform. Todoist provides an outwardly simple to-do list service, with myriad advanced features available to its more organised (or obsessive) users. One of Todoist’s most irritating limitations has been the lack of a dedicated iPad app, forcing iPad users to rely on the small-screened iPhone app for their mobile task-management needs. That may seem like a minor irritant, but ease-of-access is key to the usefulness of any to-do list. If you can’t quickly and easily maintain your list wherever you are and whatever device you’re using, you’re unlikely to stick with it for long. Developer Doist busted that limitation in late July, with the launch of Todoist version 6.0 for iOS (updated to 6.0.1 during our testing). The new version includes full iPad support, with a UI optimised for the larger screens of the current iPad, iPad Mini and iPad 2. 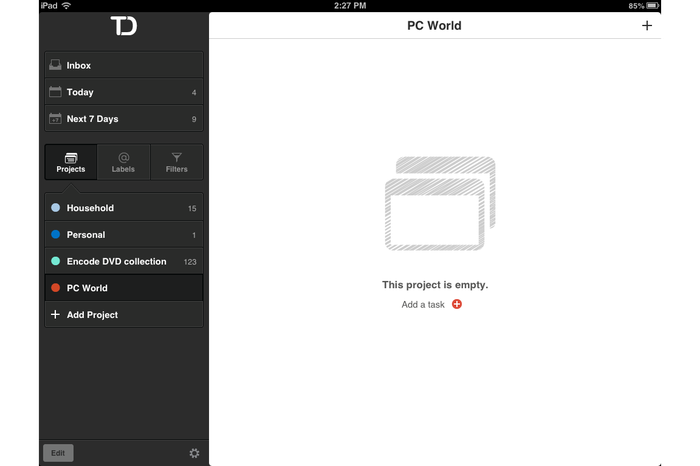 The tiny (9MB) app is free to download, and compatible with both the free and premium versions of Todoist. An upgrade to premium is available as an in-app purchase, for NZ$36.99/year. If you’re starting from scratch, you’ll be faced with the limitless potential (or intimidating white space) of an empty list. The app is tied to the online service, and requires you to log in – so you’ll need a free or premium account to get started. It’s a good idea to get signed up at todoist.com before installing the app, so you’re all set up and ready to go – I’d been using the service via the web interface and Windows application for a couple of months, so it was as simple as downloading the new app from the App Store, launching it, then entering my username and password. All of my projects and tasks were immediately visible. If you’re starting from scratch, you’ll be faced with the limitless potential (or intimidating white space) of an empty list. In previous versions of Todoist, all tasks had to belong to a project – meaning that before you could create a task, you’d have to create at least one of those. Creating a project is as simple as assigning a name and colour code, and you can be as specific or as broad as you want. For example, you could have a single ‘to do’ project under which all of your tasks live, or split it into precisely defined aspects of your personal or professional life. I use a single ‘personal’ project as a catch-all, one for household tasks, one for the neverending project to rip my own DVD collection, and one for everything PC World related. You can view tasks by-project – while I’m at work, I only look at my PC World tasks – or by everything due today, within the next seven days, or by some other criteria you define. Due dates can be entered via the onscreen keyboard, selected from a pop-up calendar, or from a list of ‘textual dates’ such as ‘today’, ‘tomorrow’ or ‘next friday’. The latest version of Todoist adds an ‘Inbox’ concept – an initial project that you can add tasks to as a timesaver, then categorise them later. If you don’t want to use projects at all, you could simply leave everything in the inbox. It’s a nice simplification for extremely casual users who might’ve been turned off by the requirement to categorise everything into projects. The inbox is also particularly useful on the iPad, for just the opposite – users who partition tasks into a plethora of projects. It gives you a temporary place to create new tasks before setting up the associated project – a nice shortcut over the older version, and over competing apps I’ve tried which also have forced-projectisation. Due dates can be entered via the onscreen keyboard, selected from a pop-up calendar, or from a list of ‘textual dates’ such as ‘today’, ‘tomorrow’ or ‘next friday’. Repeating items are very simple to create, by setting a due date such as ‘every tuesday’ or ‘after 14 days start tomorrow’. Altogether it’s one of the simplest systems I’ve seen for handling repeating events, which can often approach nightmarish ‘programming the VCR’ levels of complexity. Premium users can create due dates with times (e.g. ‘tomorrow at 18:30’ or ‘next friday at 9am’), which will result in a reminder email 30 minutes before the due date if the task remains uncompleted. I’d have liked to see direct integration with the iPad calendar – it’s possible to have tasks appear on your calendar via a iCal feed, but that’s not configurable via the app itself. 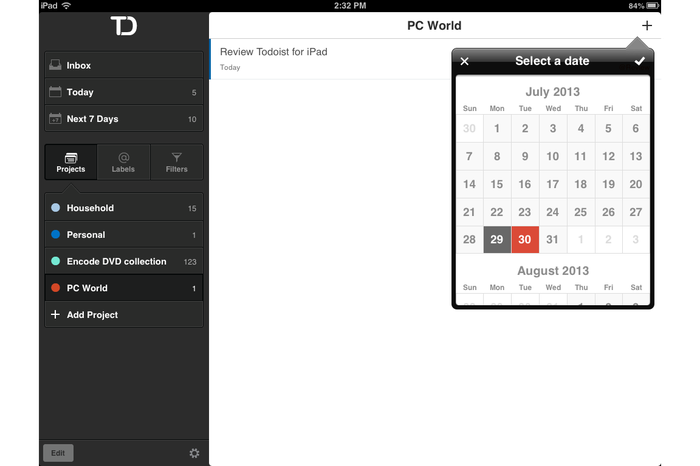 Premium users can create due dates with times (e.g. ‘tomorrow at 18:30’ or ‘next friday at 9am’), which will result in a reminder email 30 minutes before the due date if the task remains uncompleted. Tasks can be given any of four colour-coded priority levels, from ‘Priority 1’ (highest) to ‘Priority 4’ (lowest). It would be useful to be able to customise those levels, or add additional levels, but Todoist doesn’t offer that functionality through the app or otherwise. It does provide customisable labels, though, in a very ‘gmail’ style. 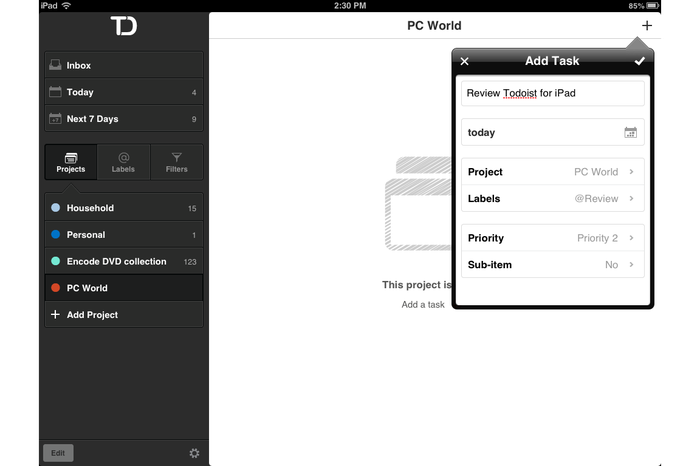 Tasks can have multiple labels, and tapping on a label in the app shows each associated task, regardless of the project it appears in. Sorely missing from the app is sorting of your task lists, in either the project or label views. Tasks appear in the order they were added, or the order they were last arranged into via the web or desktop application. You can sort by date, priority or task name via the web, and this is one of the most useful features – particularly if you work like I do, opening up a particular project and checking ‘what do I have to do today, on this?’ rather than going through the ‘today’ view which shows tasks from all projects in a single list. Tasks can be given any of four colour-coded priority levels, from ‘Priority 1’ (highest) to ‘Priority 4’ (lowest). Also missing is any access to Todoist’s marvellous ‘Karma’ system, one of the features that has kept me using the system over the last few months. If you enable Karma, Todoist awards points for creating and completing tasks, early completion, and use of advanced features such as repeating due dates. Points are subtracted for overdue and postponed tasks. Doist have finely balanced the system, meaning that the ‘productivity trend’ described by your Karma points (represented on a neat little graph) really does reflect your real-world productivity. Certainly, it did in my case – your results may vary. I’m sure there are ways you could ‘game the system’ – though you’d only be cheating yourself out of some useful feedback. Checking off tasks at the end of the day, just before I put my iPad down for the night and stop caring about productivity or due dates, is just the time I’d like to see that happy little graph climbing upwards (or plummeting into oblivion if I’ve had an unproductive day). 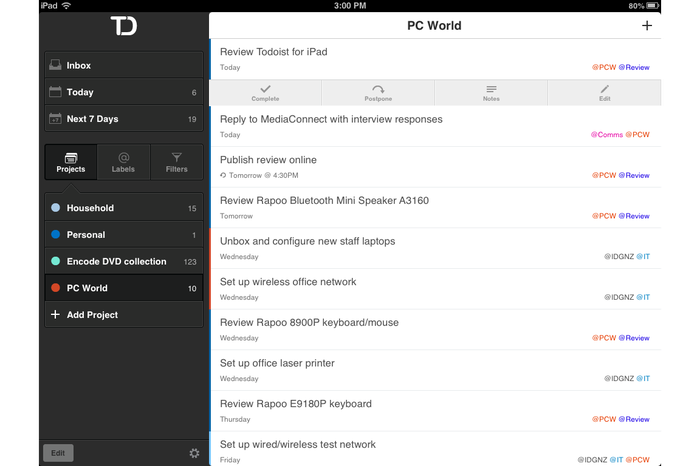 If Todoist were to appear on Windows 8 or Windows Phone, that Karma graph should be the live tile. In the iOS app, it should at least be present somewhere. Todoist provides customisable labels, in a very ‘gmail’ style. Tasks can have multiple labels, and tapping on a label in the app shows each associated task, regardless of the project it appears in. The latest iOS app joins existing client applications for Android, Windows (desktop), and Mac OS X; plugins for Chrome, Firefox, Outlook, and Thunderbird; and a fully-featured web app. The only platforms missing are the Windows app store, Windows Phone, and [if you’re the uber-corporate type] the new BlackBerry 10. If the iPad is your primary computing platform, and you intend to use Todoist as a mobile app only, its current limitations should give you pause. The lack of sorting is the worst of those, we we really hope that’s added soon. The inability to check the Karma system isn’t really a problem, per se, but it does remove one of the great advantages Todoist has over its competitors – that fun, and genuinely useful – element of gamification. If you already use Todoist via the web, its desktop apps, or browser plugins, the iPad app is well worth downloading and using. Given its ultra-reasonable price of zero dollars, and its tiny (<10MB) size, you stand to gain a lot more than you’ll spend, those limitations aside. Tapping on a task brings up a menu including 'complete', 'postpone' and other options. You can also complete tasks via a swipe gesture which is just a little too easy to perform by accident.